Millions are people in the UK alone are in money trouble. Overdrafts, pay-day loans, mortgages, the lot. They all put us face first into the dirt and fill our days and nights with stress. One of those out there is a woman, named only as Jo, who called into This Morning, and explained that an unfortunate few decisions have made paying the bills almost impossible. The caller, named only as Jo, revealed how she had been left in over £1,000 debt after her long-term partner walked out on her and her daughter – but ITV had an answer. I can just afford the gas and electricity that’s necessary, let alone the extras that an 11-year-old girl wants. In case you didn’t know – this morning’s This Morning, will be the last episode before summer, and clearly touched by the story Phil came up with a beautiful climax for the season’s end. Jo? It’s our last day [before the summer holiday] and we’re in a very good mood so we’re going to sort your debt out. You’re not in debt any more. Have a lovely summer. As you can probably imagine, Jo didn’t know how to respond and thanked Holly and Phil to her heart’s extent. But it doesn’t stop there, Twitter users were also touched by their kind actions. #thismorning How you helped Jo with her debt! Bought a tear to my eye, I hope her summer is less stressful now. You're wonderful people! 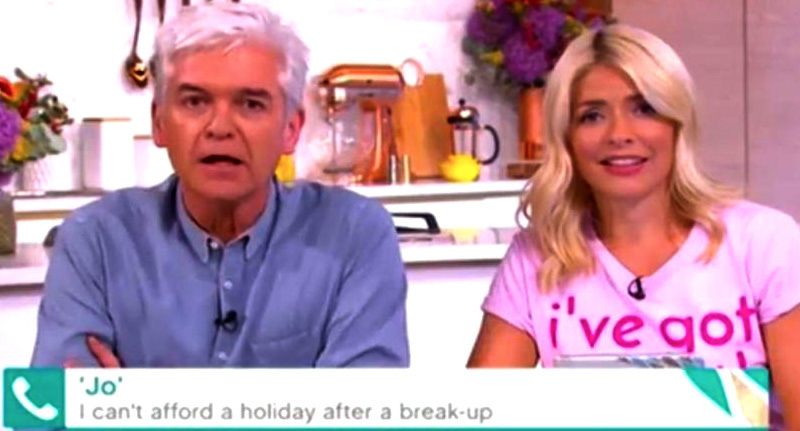 However others were quick to state that it’ll be ITV’s money paying off the debt and not Holly and Phil’s. Ah well, at least that’s one less person in the world oweing more than they can pay to the fat cats. Hopefully Jo can get herself back on her feet in the near future and have a cracking summer with her daughter.